1997 first fireants found in Calif. In 2005, 13,000 acres infested. In 2006, between 10,000 and 12,000 acres. United effort will close door on fireant. All honeybee shipments entering Calif. are subject to two inspections. The first is a cursory inspection at the border station. The second is a more detailed inspection, at destination. This year CDFA implemented a pilot voluntary apiary certication program. 16 states participated in program. Shipments entering Ca. with certification, issued by a regulatory official in the state of origin, stating that the shipment is free of RIFA and other pests will be subject to less stringent border and destination inspection requirements than shipments without certification. Under this new program certified shipments will have a tolerance of five or fewer hitchhiking worker ants without being rejected at the border. Additionally, certified shipments, which are pest free, will be allowed to offload at destination without waiting for clearance from the County Agricultural Commissioner. Although this program is not mandatory and certification is not required to enter Ca. beekeepers are urged to have their colonies inspected and certified to expedite entry. Contact your state apiariest to determine if they are participating in the pilot program. Clean pallets or new pallets? Did you use a pest control service? What type of chemical did you treat for fireant? What procedure have you used in your yards or holding areas? Combine all the above information into one record. Inspectors at California’s Border Stations will check the exterior colonies and pallets for RIFA, noxious weeds and any other significant pests, dirt and debris, or anything else that could harbor pests. If any pests are found on uncertified shipments or more than five worker ants or other pests on certified shipments, the colonies and pallets must be cleaned prior to entering the state. Following pest management practices, obtaining certification and taking care when loading the bees assure they are free from soil, weeds, and other debris will help avoid most problems at the border. If no pests are detected at the border station, the shipment will be placed under a QUARANTINE HOLD NOTICE and allowed to proceed to destination where it will be subject to inspection by the County Agricultural Department. To issue this notice the driver must provide information about the shipment necessary to notify the appropriate county of the impending arrival of the shipment. Drivers should be prepared to give the exact physical address of the location where the colonies will be placed. (P.O. Boxes are not acceptable), the number of colonies, and the State of most recent origin. Township and range information may be substituted for a physical address. Apiary health certificates are not required to clear shipments at the border station. The driver or owner will be instructed to contact the county inspector, via phone, at destination – Uncertified shipments may not be unloaded until permission to do so is given by the county inspector. California law (Sections 29046(a), Food and Agriculture Code) requires that bee colonies be “posted”, meaning that each location where bees are placed must have markings that designate the person or persons responsible for the bees. This requirement can be met by markings on boxes or a conspicuous sign that includes a name, address and phone number where the owner or his/her representative can easily be reached. 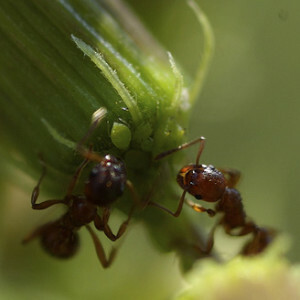 Pollination Contracting has talked with County Agriculture Departments and has been advised of new policies concerning entry into California from out of state beekeepers in regards to the quarantine of the fire ant. Bees arriving from quarantine states will be inspected (in the county of destination) before they are unloaded from the truck. It is our understanding that all out of state beekeepers will be given a 008 form at point of entry into California. The 008 form requests that the beekeeper contacts the County Agriculture Department of destination and notify them as to their arrival. A copy of the 008 form will be kept by the beekeeper, while another copy will be faxed to the County Ag. Department of destination. Parasitic mites are still a problem and RNA virus diseases, vectored by Varroa mites, incapacitate and kill bees all year long. 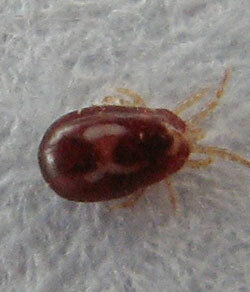 Varroa mites (varroa jocobson) first arrived in the United States in 1987. The mite is a native of Asia where its original host was Apis cerana. When the European honey bee, Apis mellifera, was introduced into Asia, varroa mites apparently transferred to this new host as the two species of bees came in close contact. The mite was subsequently carried back to Europe and into South America with movement of honey bee colonies. It is now found throughout the world. It was first discovered in 1987 The varroa is an external parasite of both brood and adult bees. Although not a major enemy of Apis cerana, it is considered a serious pest of Apis mellifera (DeJong 1997). Status in California as of Feb. 2006 was found mostly in southern counties, rated as “Q” Inspections were to continue throughout California. 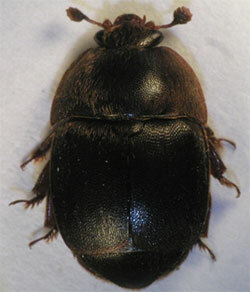 The Small Hive Beetle, Aethina Tumida A New Beekeeping Pest by Keith S.Delaplane, U of Georgia.